(Newser) – The solution to America's addiction to painkillers may be … more drugs? 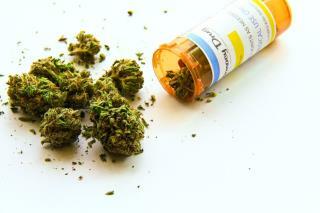 A new study found a drop in painkiller overdose deaths in 13 states that allowed medical marijuana, CNN reports. That's because a patient prescribed marijuana will either stop taking opioids or take less of them, researchers theorize. From 1999 to 2010, researchers found that in the year following passage of a medical marijuana law, states saw a 20% decrease in opiate overdose deaths compared to states without one; that grew to 33% over the following six years, the Los Angeles Times reports. Abuse experts say marijuana may stem "runaway rates" of opioid overdose, which have tripled since 1991 in the US and are now responsible for 46 deaths per day, adds Newsweek. States should make medical marijuana for all conditions that it can be beneficial for. This will serve as a countermeasure to the poisonous enthusiasm for opioids that is promoted by Congress and pain specialists. Currently the National Pain Strategy us being developed by pain specialists at IPRCC and is backed by Congress- the same pain specialists who promoted opioids are creating this national pain plan. Evidence is clear, that pain specialists have been well paid for promoting opioids- and likewise the evidence is clear that opuioids for noncancer pain lack long-term efficacy. So the pain specialists have proven themselves to be unscientific and inhumance in promoting opioids, They should have and could have been promtoing intelligent use of all available treatments including marijuana or working to develop truly new treatments for pain. Moral and mental laziness and greed is behind the opioid economy. If the public calls for real change then we may have better pain care. I does enhance pain killers, but alone cannabis is useless for pain.